On August 27, 2012 the Edmonton cycling community was shaken by the death of Isaak Kornelsen. A member of the University of Alberta Golden Bears cross-country and track and field teams, Isaak was an avid cyclist and died in an accident while cycling to work at Cafe Mosaics on Whyte Avenue. In the aftermath of this tragedy memorials popped up to remember and celebrate his life, including a memorial ride organized by the Edmonton Bicycle Commuters’ Society. Meanwhile, a former Golden Bears teammate, Jonathan Behnke, came up with a creative concept to memorialize Isaak through public space. Now a student in the University of Guelph’s Landscape Architecture program, Behnke designed a memorial parklet as part of a school project. 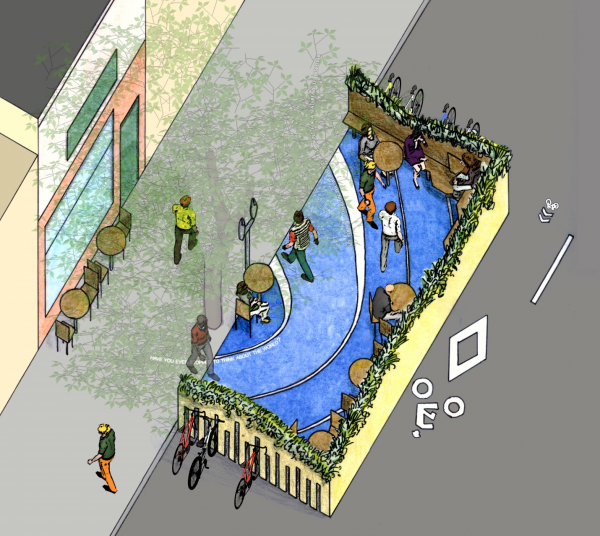 Behnke envisions the Isaak Kornelsen Memorial Parklet, a temporary urban park that extends into the street, to occupy a space in front of Cafe Mosaics. The parklet would take up two parallel parking spaces and half of the adjacent driving lane. Behnke notes that, “By extending into the driving lane, motorists are forced to slow down as they pass the site, signifying that there are other forms of transportation in the area that are of equal importance.” The parklet would also create parking space for 28 bicycles. Other elements pay homage to Isaak’s successes in track and his love of music. Behnke has designed the parklet’s ground surface as an abstraction of the lanes of a running track. In addition, a tiered bench in one corner can act as an impromptu and intimate stage, where friends can sing or play a guitar. Vegetation also integrates into the design. By having the vegetation spill over the parklet’s angular walls, Behnke hopes it will encourage people to celebrate Isaak’s life, rather than focusing on his death. Of his inspiration for designing the parklet, Behnke says, “While honouring Isaak, I [wanted] to create a public space that will give this section of Whyte Avenue a more human scale, where pedestrians and cyclists can feel safe and welcome.” Ultimately, Behnke hopes his vision might one day become reality and stand as a novel example of a public space that embodies the ideals of the young man it tributes. This is a well-thought-out and beautiful idea – I’m looking forward to seeing this become a reality. In Port Credit, businesses can pay to replace parking space with walkways … so they can have outdoor patio space during the summer. If it can be done for patios, then it can also be done for an an appropriate public memorial … or a summer parkette, for that matter. Don’t hold your breath waiting for this memorial to ever be built. I started off thinking that this idea was an interesting student design project, but as someone who regularly cycles, walks and drives past the spot in question I thought that we simply didn’t need yet another memorial to this tragedy. With the City’s coffin-shaped fatality sign, the tree festooned with yellow plastic, the hand-written sign, and not one, not two, but three ghost bicycles (now removed) anyone who had the slightest interest was already aware of what had happened. However, after rereading the proposal I have to give Jonathan’s project a failing grade . This section of Whyte Ave is not an easy ride. It is a busy, congested urban street with many potential distractions, and the curb is never free of parked cars. The parklet itself night “create a public space… where pedestrians and cyclists can feel safe and welcome.” but the adjacent roadway certainly wouldn’t. Pushing cyclists and two lanes of traffic into one and one-half lanes to make room for the parklet will Instead result in a severe traffic hazard. The memorial may not be as impractical as the recent Vent in the Edmonton Journal complaining that the City has not built roofs over all of the city’s bike trails, but the memorial probably has even less chance of being built as proposed than the bike trail roofs do. At least the bike trail roofs wouldn’t result in more cyclists’ deaths.